Imagine you are a high school senior photographer. You ONLY photograph seniors. You need some new business, so you decide to go put up some fliers (like 8.5×11 printed fliers with thumbtacks). First, you put up some fliers at a local college, then you stop by a daycare, and finally you leave some at the local nursing home. Phew. Lots of fliers up all over the city, you’re bound to get some new inquiries right? Wrong. Of course this wouldn’t be very effective, because you TOTALLY missed your target demographic. Almost zero high school seniors are even going to see your fliers. This seems obvious right? Most people get this part with Facebook ads. They know about targeting, and setting some basic demographic information and maybe even picking some interests. People have been teaching about this for years. But let’s go back to the analogy for a second. Let’s assume that you were a smart flier-putter-upper. You get permission to put up fliers at a few high schools, and at the local coffee shop where a bunch of high-schoolers hang out. In this case, you are much more likely to reach your target audience. But what if I told you that putting up fliers is one of the LEAST effective ways to get new clients, especially high school seniors? It is expensive (especially for color copies), takes a lot of time, and usually, the fliers are completely ignored or covered up within hours. Not to be confused with the idea that fliers are COMPLETELY useless. Just that they aren’t as effective as reaching seniors on Snapchat or Instagram, or having a senior rep program. This is the same idea with Facebook ads where you target your audience based on their demographic information or interests. It can work. This kind of ad isn’t completely useless. 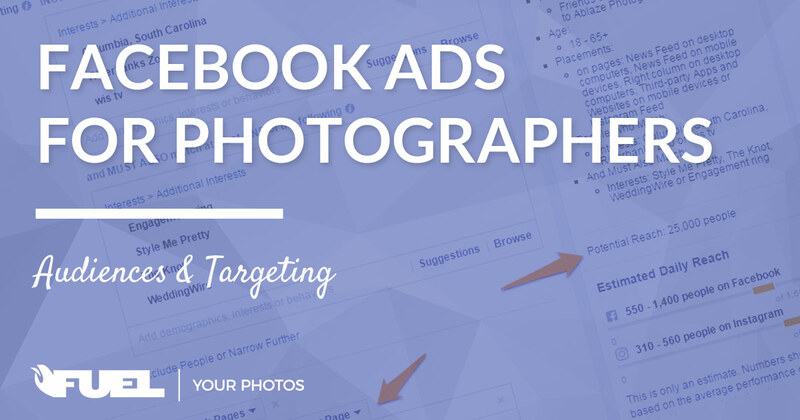 It is just one of the most expensive and least effective ways to use Facebook ads, and much more efficient targeting options exist. Don’t you wish you knew what they were? ::wink:: Keep reading my friend! In last week’s post, we laid the foundation for our campaign by choosing the best objective for our Facebook ads. This week, we’ll delve into audiences. We’ll talk about targeting, re-targeting, and all the different methods available for creating audiences for your Facebook ads. Let’s look at the type of targeting options that are available when you are running Facebook ads. Demographics can be a little tricky to access. You can easily select age and gender when using the ad manager, power editor, or audience insights. However, the more advanced demographics are hidden away in different places depending on which tool you are using. You may also be able to access different demographics based on where you are selecting the audience. In the Audience Insights tool, you can expand the “Advanced” tab to access extended demographic categories. In this screenshot I selected women, aged 25-40 who are engaged, have a college education, and work as a nurse or in the healthcare/medical field. You can get really creative with the combinations here, and there are more options available than I can even start to mention in this post. You can play around with the demographics here in the Audience Insights tool, then save the audience to use in an ad later! In the power editor or ad manager, you can access even more demographics. Again, they are fairly hidden. Under “Detailed Targeting” you have to click Browse, then you can use the dropdown to browse the demographic categories. You’ll see the ones that are available in Audience Insights, along with some other options like “Generation” and “Friends of.” You can also choose Ethnicity (limited) and other life events here that are not available in the Audience Insights tool. You can create and save an audience using the Audience Insights tool, select that audience when you are creating your ad set in the power editor, THEN edit it further to tweak the little things. Using demographic targeting requires an intimate understanding of your target audience. The more you know about your ideal client, the more effective your demographic audience will be. Of course, after you choose the demographics, you can take it to the next level with interests. When you select the Interests dropdown, you get some broad categories, and then you can narrow down a little further by clicking the arrows. Keep in mind you can add the entire topic, or the more specific subcategories. But the real power of interests is that you can type in whatever you want. Facebook pages, TV shows, cities, websites… the possibilities are endless. Unfortunately, most small pages are not available for targeting, so you usually won’t be able to pick your competitors or local vendors as interests. When you add multiple interests, you are saying that you want to target any person that likes any ONE of those things. So if you include “interest 1” and “interest 2,” your ad might be displayed to someone who likes interest 1, but doesn’t like interest 2. This can come in really handy. For example, you could use the first box to select several local interests (local attractions, news stations, personalities, etc.) and then use the second box to make sure they ALSO like wedding related interests (assuming you wanted to target local brides/grooms). Don’t get me wrong, I love getting creative with demographics and interests. I could create these audiences for hours. These are still random strangers. They have no affiliation with your brand or business (in most cases). If you use these audiences and try to jump straight to selling, you’ll likely be very disappointed with your results. Go back and read last week’s post about objectives if you haven’t already. Interest and Demographic audiences are good for awareness, engagement, and even traffic (if you are sending to a post that adds value without asking for anything in return). If you don’t already have an audience of loyal followers you can use this kind of targeting to start building your following. However, there are options for targeting that will allow you to take advantage of your current audience (Your FB Page likes, website visitors, and email subscribers). These options will almost always be more effective (and less expensive) because you aren’t advertising to random strangers. You can target people who like your page, and friends of people who like your page. When you boost a post, you can choose both of these together, but when running any other type of ad, you’ll have to create separate audiences for each. One of my favorite ways to use connections is to narrow a larger audience. When I narrow the audience from the last example to “friends of people who like my page,” I get a smaller audience (25,000 instead of 180,000 in this case), and I also know that they are connected to someone who has already “endorsed” my business with a like. Connection targeting is also a great way to reach your fan base, especially with the decline of organic reach. If you have built your page likes naturally, and the people who like your page are genuinely interested in hearing from you, you can use connection targeting to make up for the fall of organic reach. If your audience responds well to your sponsored posts, this can be very cost effective. On my photography page, I have about 1,300 likes and I can usually reach about 1,500 people for $3-5. But connection targeting can go beyond just awareness/engagement. You can also make offers to your fans and expect to see a much higher response rate than you would from an audience of people selected based on their interests. Don’t give up on getting people to like your Facebook page. Even though organic reach is dead for most business pages, Facebook ads can breath life back into this audience! Lookalike audiences are basically audiences that Facebook makes for you with magic fairy dust. Facebook will look at your initial audience, then find people who they believe are “similar” to that input audience. From what we know, these audiences are especially effective at finding people who are likely to take similar actions to the input audience. You can build lookalike audiences from your Facebook Page, your website visitors, website conversions, or an email list. Again, I almost always use lookalike audiences as a way to narrow a larger audience. Take the example from above. Instead of narrowing it down to friends of people who like my page, I could also show the ad to people that Facebook has deemed similar to the people who like my page. You’ll have to get creative and experiment with lookalike audiences. If you run ads to the raw lookalike audience without further narrowing, they probably won’t be very effective. Especially not for photographers who are trying to reach local clients. However, they can be a great way to extend an audience that is too small to use for advertising. For example, lets say that you have a custom audience of people who have visited your website (we’ll get to that in a minute), but it is only 500 people for the last month. You could create a lookalike audience of 2 million people that Facebook thinks are similar to the 500 people who visited your website. In this case, I would try getting this lookalike audience to complete a similar action as the input audience. So if it is generated from people who visited your website, I’d set up a clicks to website ad and try to get people in the lookalike audience to visit your website. Now your website custom audience will grow to include much more than 500 people, and you can move to the final stage of advertising to those people! Speaking of which, let’s talk about custom audiences. Custom audiences are the holy grail of Facebook Advertising. For photographers, it is often difficult to use custom audiences, because we don’t get enough traffic to our site or we don’t have a large email list. That is why it is important to understand all of the other types of ads and objectives we’ve discussed so far. The reason we want to drive traffic to our site is so that we can build a custom audience of people who are FAR more likely to purchase from us. We’ll create that list using a Website Custom Audience (WCA). When we run an ad to these people, it is called retargeting, or remarketing. 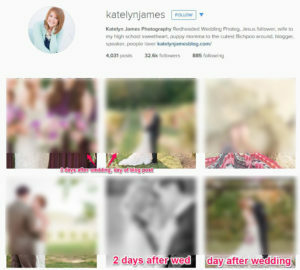 There are also two other types of custom audiences that can be useful for photographers. Customer files (a list of your customers’ email addresses), and Engagement on Facebook (people who have viewed a specific video). For now, I’ll focus on the “Website Traffic” audience. If you have time to learn more, take a few minutes to go read Jon Loomer’s “Definitive Guide For Remarketing” before moving on. All of these things require that they take an action that indicates interest. Even if they are just looking at some pictures of a friend, they now have an elevated awareness of your brand. Assuming they like the pictures of their friend, they now know that you exist, know that you do a good job, and are far more likely to remember your brand if it shows up again. Now all you need to do is stay at the top of their mind and drive home that brand recognition until they are ready to hire you. Another great thing about website custom audiences is that you can identify specific actions that predict what people were doing on your site. For example, if people viewed your pricing page, but did NOT view your contact page, maybe they thought the price was too high. Or maybe they just couldn’t find your contact page. Or maybe they got distracted and forgot to contact you. Website custom audiences are usually the easiest audience type for achieving a perfect message to market fit. I usually have great relevance scores with ads that go to my WCAs. The better your relevance score, the less expensive it will be to reach the same people. For this reason, WCAs are often the most efficient and effective way to run ads on Facebook. In my experimenting over the past few months, these audiences usually get me the same results for about half the price of my interest/demographic audiences. Even though these people are the most likely to convert, you don’t necessarily need to go for the jugular as soon as you have them in your audience. People often need to see your brand multiple times before they are ready to purchase. And we all know how annoying it is to visit a website and then see our newsfeed overtaken with aggressive ads immediately. Drive traffic with your interest, demographic, connection, and lookalike audiences. Write a new blog post. Use a CTW ad to show the new blog post to the people who viewed your last blog post with a WCA. Sprinkle in step 2 to continue growing the audience (these audiences will likely be slightly more expensive to reach). Repeat steps 3-4 with each new blog post to keep reaching the same people and keeping them engaged. After the have viewed several blog posts, make them a special “loyal reader” offer! Now that you have an idea of the types of audiences you can use, it is time for you to start building your own audiences! Here are some action items for you to consider! Go play around with the audience insights tool and save a few audiences that you think would be interested in hearing about you. Make sure you have the Facebook pixel installed on your website and start building your Website Custom Audience! Build a few lookalike audiences from your available sources. Start playing around with combining the audiences, layering the audiences, and using the audiences to filter each other. Very insightful post! 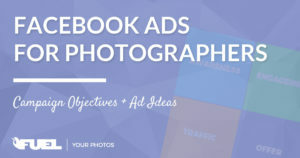 I’m just getting started with Facebook ads, and this post provides tons of great information I didn’t otherwise know about. Thanks!